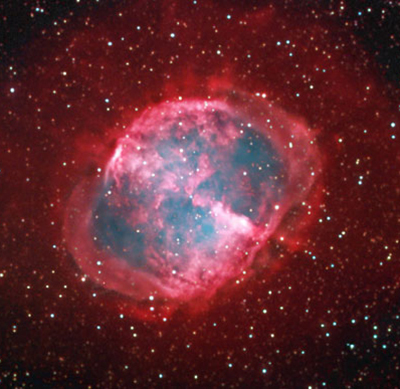 Dumbbell Nebula is a nebula that looks like a dumbbell in the constellation Vulpecula, at a distance of about 1,360 light years. This gas cloud spreads over a distance of 4.5 light-years of space. This nebula can be spotted with a regular set of binoculars. It was the first planetary nebula to be discovered by Charles Messier, in 1764. Hence, it has a relatively low number in the Messier catalogue, M27. The expansion velocity of this cloud was calculated to be 31km/s. Its central region consists of patterns of dark and bright cusped knots. Some knots look like symmetric knots with tails, some like irregular tail-less objects. The center is believed to contain a large white dwarf star.